Join us for the Spring 2019 Mentor Program Lunch. 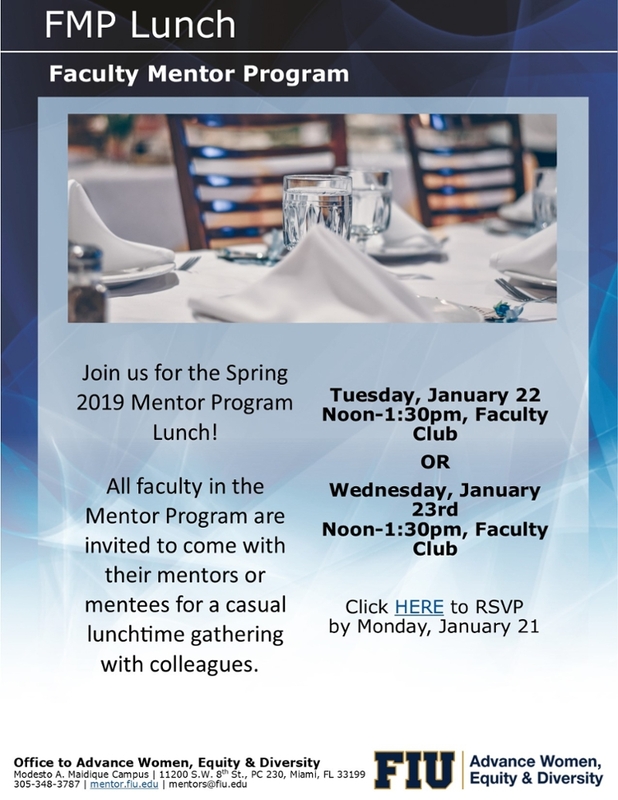 All faculty in the Faculty Mentor Program are invited to come with their mentors or mentees for a casual lunchtime gathering with colleagues. Lunch will be provided by UFF-FIU from noon-1:00pm, and all are welcome to attend. 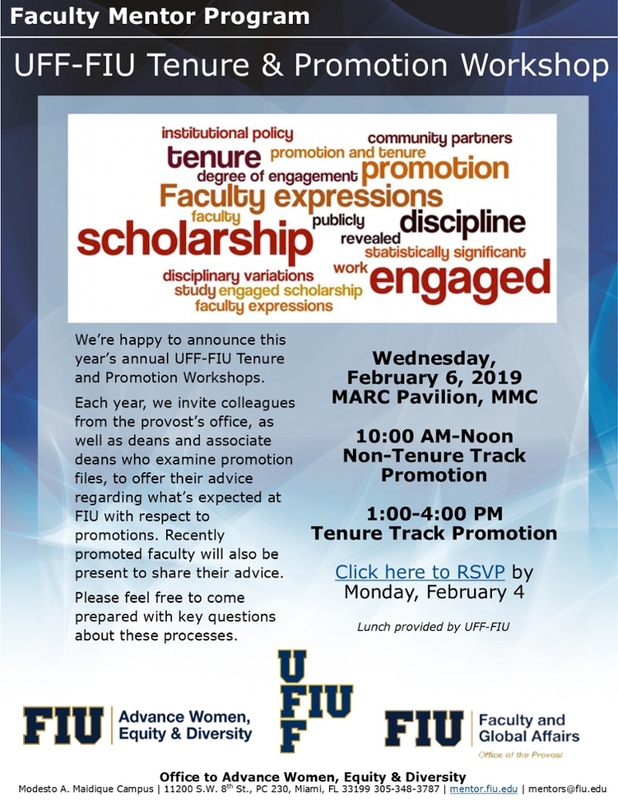 Please join the United Faculty of Florida(UFF) and Florida International University(FIU) in our annual annual Tenure & Promotion Workshop for Non-Tenure and Tenure-Track Promotion workshop. Each year, individuals from the provost’s office, as well as deans and associate deans who examine promotion files, offer their advice regarding what’s expected at FIU with respect to promotions. Feel free to come prepared with key questions regarding the processes and approaches administrators tend to take when reviewing files. In collaboration with THE MARC U*STAR and QBIC programs. 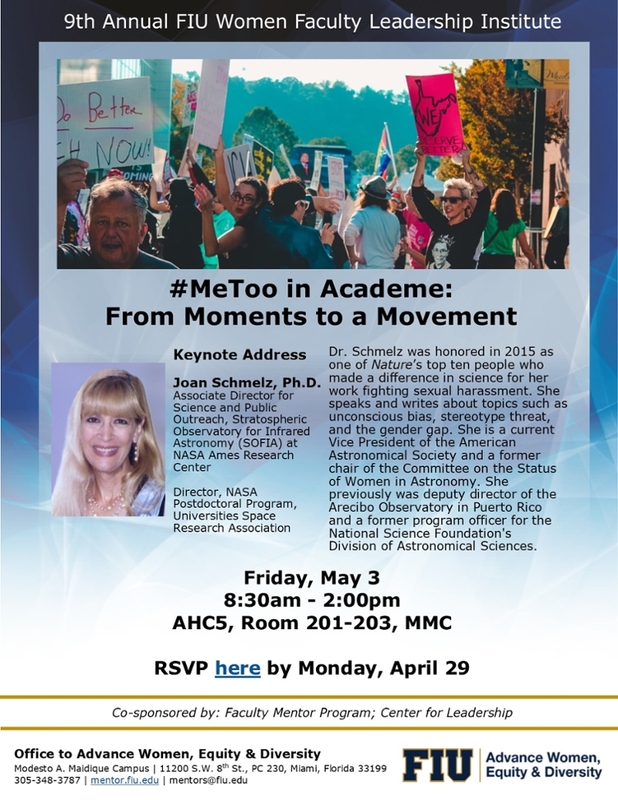 Attendees will be exposed to exceptional FIU women in the STEM fields that have pioneered major advancements within the community. This exposure will provide attendees with an opportunity to discuss common struggles women face in male-dominated arenas. The speakers will share their successes as well as the adversities they encountered throughout their journey. Event is free and open to all of FIU. Breakfast, refreshments & lunch will be provided. The opening remarks were delivered by Suzanna Rose. Join us for a year-end summer planning session! 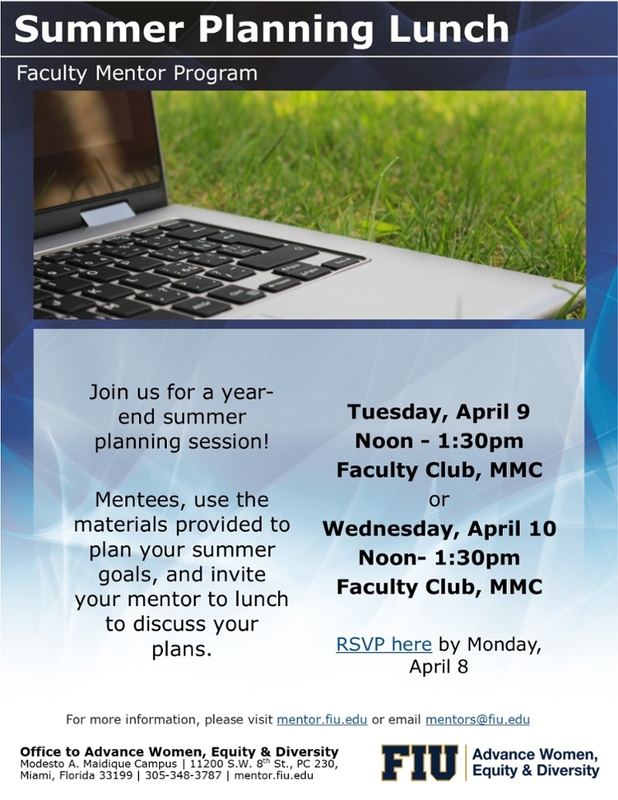 Mentees, use the materials below to plan your summer goals, and invite your mentor to lunch to discuss your plans. Alicia Lanier served as the Facilitator and project management coach on the South Florida Water, Sustainability and Climate Research Project, a 5-year, $5M research project led by Dr. Mike Sukop. Dr. Sukop and his research team embraced the energizing group process activities Alicia introduced to support the collaboration that was necessary for this interdisciplinary project. These activities focused on self-organization, dialogue, and continuously learning together and adapting. The team used the selected activities to plan their research together on an annual and whole project scale, identify technical dependencies across their research, and plan papers for a special journal issue. Alicia will describe the activities and cover the 'when, why, and how' they were used to support collaboration and knowledge co-production. Part of the Sea Level Solutions Seminar series. 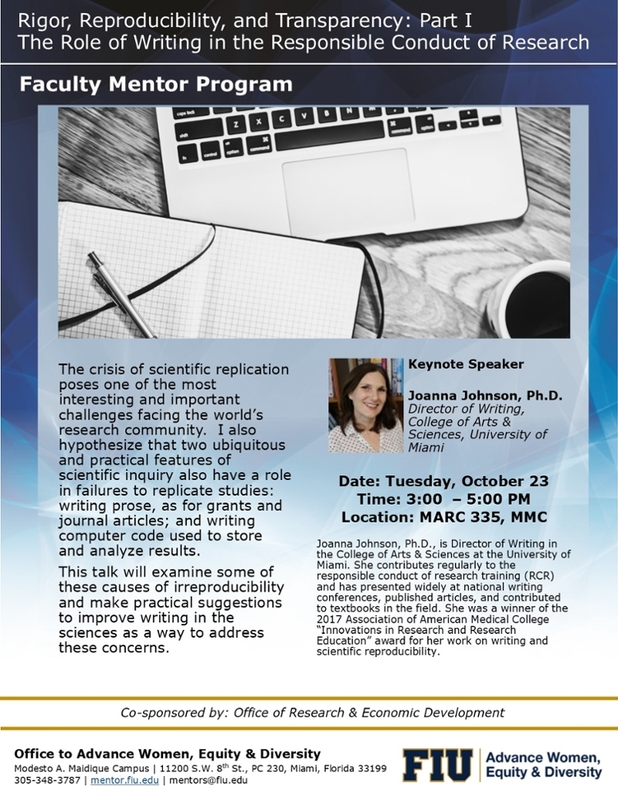 This talk will examine causes of irreproducibility and make practical suggestions to improve writing in the sciences. 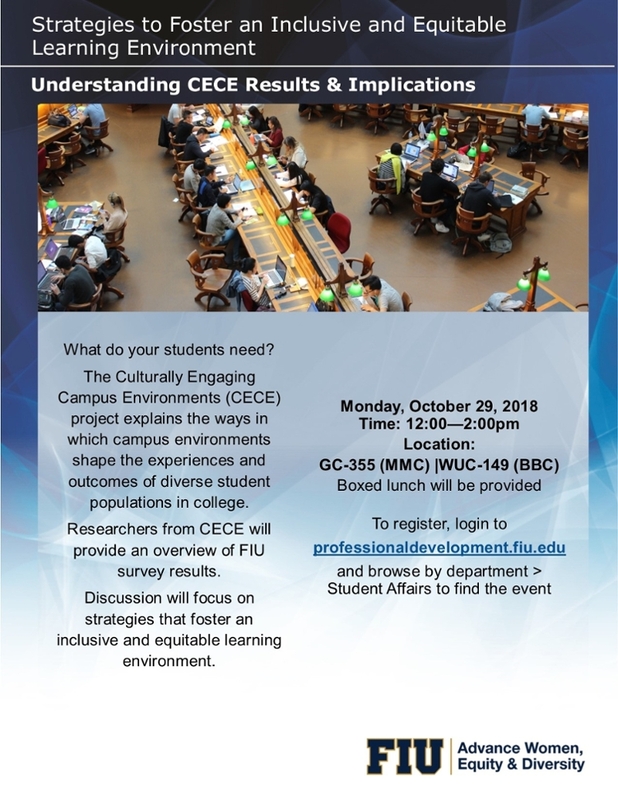 Researchers from the Culturally Engaging Campus Environments (CECE) project will provide an overview of FIU survey results. To register, login to professionaldevelopment.fiu.edu and browse by department > Student Affairs to find the event. 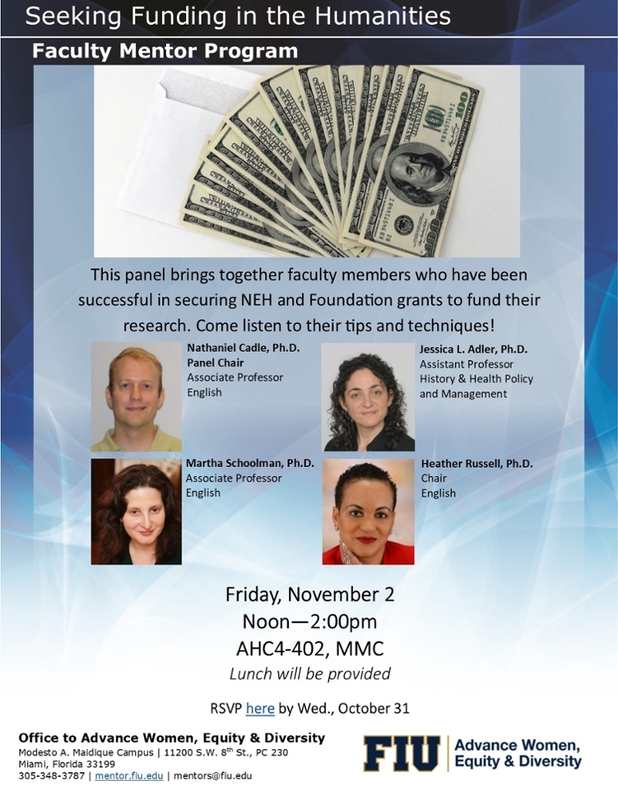 This panel brings together faculty members who have been successful in securing NEH and Foundation grants to fund their research. Panelists include Jessica Adler (History & Health Policy and Management), Nathaniel Cadle (English), Heather Russell (English), and Martha Schoolman (English). 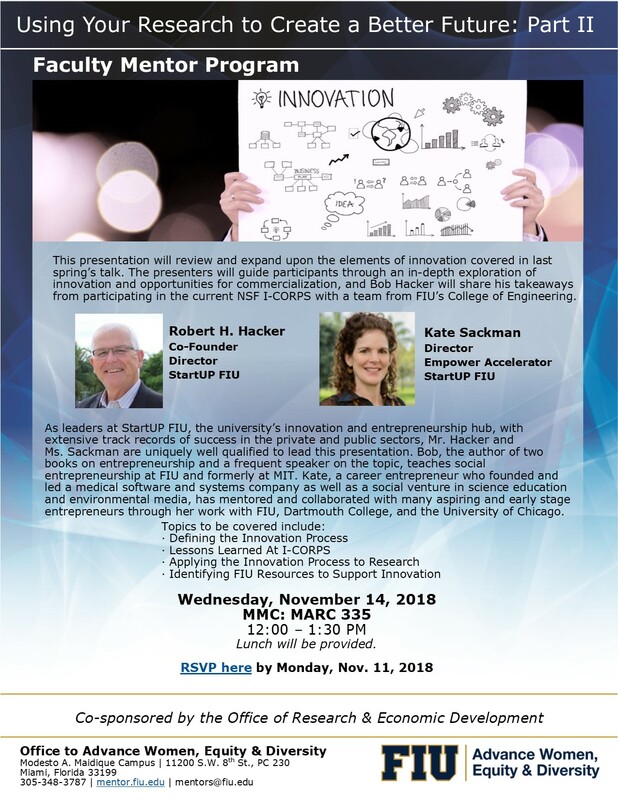 Leaders from StartUP FIU will guide participants through an in-depth exploration of innovation and opportunities for commercialization. Lunch will be provided.